The recent visit of Joshua and Jordann, our two oldest grand kids, was too short. We crammed as many movies, bowls of popcorn, trips to the mall, computer games, and visits with friends as we could into the few days they were at our house. Be we did manage to squeeze in one science activity that was quick, easy, and one the kids could do at home. Kids love to create the bubbles made by dipping a circular frame into a soap solution and then blowing on the film. A circle is a geometric figure confined to a plane. In other words, a circle is flat, two-dimensional. When dipped, a circular frame creates a disk-shaped soap film. 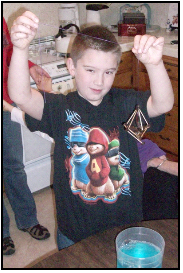 What happens if 3-dimensional shapes are dipped in a soap solution? 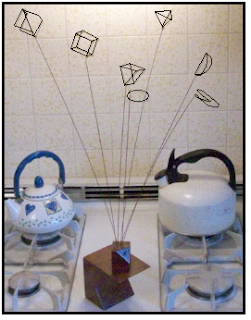 Years ago I made a set of wire-frame shapes for dipping into a soapy solution. The shapes include a wire cube, triangular-based pyramid, triangular prism, and a Möebius strip. The ends of the wire frames sit in holes drilled in a block of wood and make a nice geometrical bouquet for my office desk. 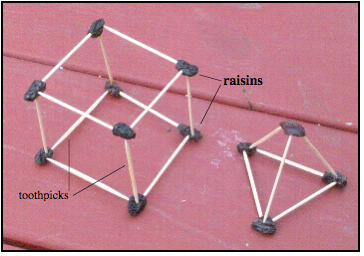 Kids can easily make similar models using toothpicks, large raisins, thread, and dish washing soap. Simply show kids how to stick toothpicks (edges) into raisins (vertices) to make a shape. Have them tie a short piece of thread to the shape for dipping. Below is a model of the vertices and edges of a cube (hexahedron) and a triangular-based pyramid (tetrahedron). I call models with only edges and vertices edge-frame models. Pour a quarter-cup of dish washing soap into a container of water (don’t pour water into the soap as it will create suds) large enough to accommodate the size of the shapes. Let the kids dip each shape and marvel at the surprising ways the soap films form on each shape. 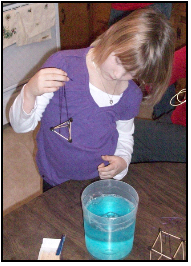 Jordann dips her tetrahedron and looks at the surprising way the soap films on the four faces intersect insidethe model! Several forces are present in a soap film. There’s surface tension, adhesion, and cohesion. Dipping the frames in soap solution and observing Water droplets are attracted to other water droplets. This is called cohesion. Water can also be attracted to other materials. This is called adhesion.Surface tension is the name given to the cohesion of water molecules at the surface of a body of water. Blowing and dipping bubbles is a good introduction to these science topics. Multiple soap films intersect in whatever way minimizes the energy of all of the films taken together. This causes the films to pull together into the patterns seen in the dipped edge frames. Perhaps the most unusual and unexpected shape is made by first dipping a cube edge-frame (blue cube) and then quickly dipping it a second time to capture a bubble in the center. The bubble in the center forms a smaller cube (red cube) with its 8 vertices connected to the vertices of the larger cube (green lines). The trapezoidal planes formed by a blue base line, the opposite red line, and the two green edges are beautiful to behold. Wrinkle in Time by Madeleine L'Engle is a very popular science fantasy book read by millions of upper elementary school children. 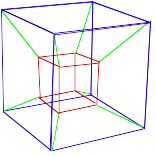 The main plot device is a tessaract, the edge-frame projection onto 3-dimensional space of a 4-dimensional The cube within a cube is that 3-space projection. In a later post I will refer back to the soap frames as we learn about the numerical relationship between the number of edges E, vertices V, and faces F in any edge-frame model. What's the shape of the bubbles produced by blowing on the shape-frames? Try this activity and find out! Will you agree with me that the Internet is surely a good place to get vital information and leads on photo and film?